John Linnell (1792–1882), Homeward Bound (1861), oil on canvas, dimensions not known, location not known. Wikimedia Commons. Prior to 1846, John Linnell (1792–1882) had prospered as a painter only by working mainly in portraiture. His great love was landscape painting, and he also made some religious and narrative works. Then in 1846, his fortunes changed, thanks to a wealthy dealer and collector who seemed happy to part with hundreds and even thousands of pounds when he wanted Linnell’s paintings. The artist could now, at last, afford to be more selective in the portrait commissions which he accepted, and to devote more time to landscapes. John Linnell (1792–1882), Noah: The Eve of the Deluge (1847-48), oil on canvas, 150 x 223.5 cm, Cleveland Museum of Art, Cleveland, OH. By Wmpearl, via Wikimedia Commons. Buoyed by this sudden increase in sales, Linnell started work on the large canvas of Noah: The Eve of the Deluge in the spring of 1847. 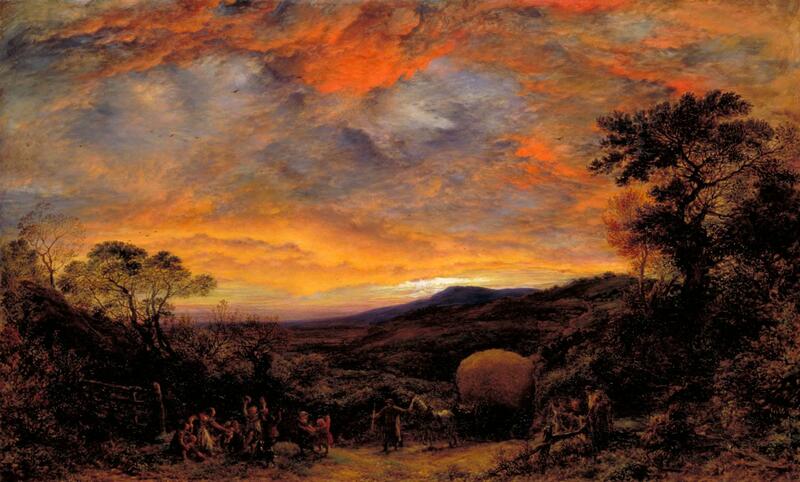 Although on a religious theme, it is also a dramatic landscape which set the mood for many of Linnell’s remaining works: the rich colours of twilight. It was sold only a couple of months after Linnell had started work on it, for £1000. It was exhibited at the Royal Academy, considered by the artist himself to be one of his major works, and was even criticised by John Ruskin, in the second volume of his Modern Painters. Unfortunately Ruskin appears to have misunderstood its subject, and dismissed it (characteristically, perhaps) as being “devoid in invention”. This did not affect Linnell’s popularity with collectors, though. In 1851, Linnell moved his family to a house which he had built for them just outside Redhill, Surrey, where he spent the rest of his life. Living in the rolling North Downs, in the rich agricultural belt around London, provided him ample opportunity for the landscape painting which he so enjoyed, and which was now so well appreciated. Linnell also recognised the talent of the Pre-Raphaelites, and he gave Holman Hunt and Millais support and friendship from 1852 onwards. Harvest Home, Sunset: The Last Load (1853) shows the final wagonload of cut grain leaving the fields at dusk, as the harvest is completed. 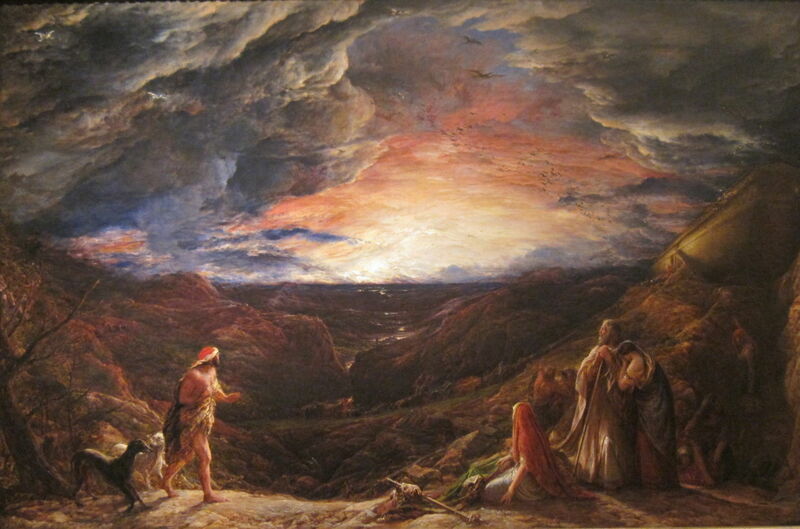 Its composition and lighting could put it among the works of Samuel Palmer and the Ancients. John Linnell (1792–1882), A Finished Study for ‘Reaping’ (1858), oil on panel, 21 x 33 cm, Yale Center for British Art, New Haven, CT. Wikimedia Commons. Like John Constable before him, Linnell’s oil sketches and studies have rich and expressive brushstrokes. If the chroma in his A Finished Study for ‘Reaping’ (1858) were turned up, it might easily be mistaken for an Impressionist work. However, it was not intended for the eyes of the public, for which Linnell provided Salon-quality finished paintings. John Linnell (1792–1882), The Prophet Balaam and the Angel (1859), oil on paper, laid down on canvas, 49.2 x 71.1 cm, Museum of Fine Arts, Houston, TX. Wikimedia Commons. The Prophet Balaam and the Angel (1859) shows one of the more obscure stories from the Old Testament Book of Numbers, revisited briefly in Revelation. Balaam was a non-Israelite who declared himself a prophet. Although he would not curse the Israelites, the Biblical account claims that he went to King Balak of Moab and explained to him how he could get the Israelites to fall into sin by enticing them with prostitutes and unclean food. When Balaam had set out to go and curse the Israelites, an angel appeared, first to the donkey that he was riding, and then to Balaam too. The angel told Balaam that the donkey was the only reason that Balaam had not been killed. Balaam then repented, but the angel told him to continue. 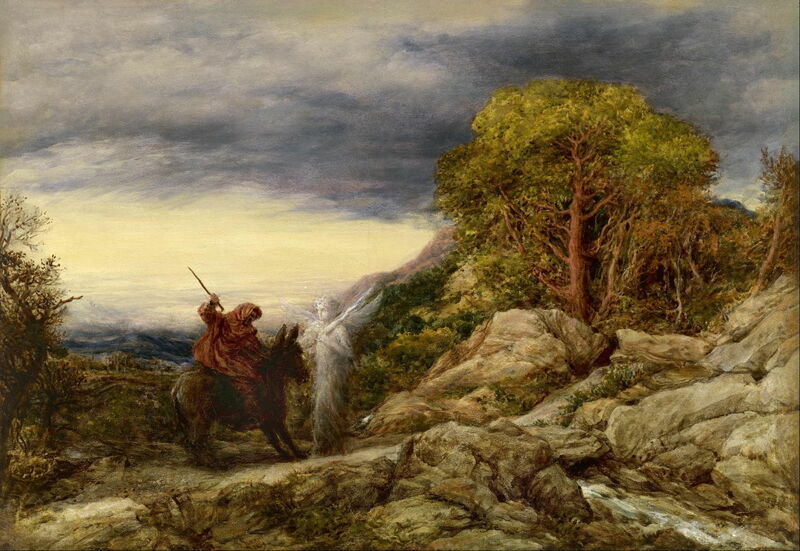 That is the scene shown in Linnel’s painting, as Balaam (who at this stage cannot see the angel) beats his donkey to move on, but the angel will not allow the donkey to pass. 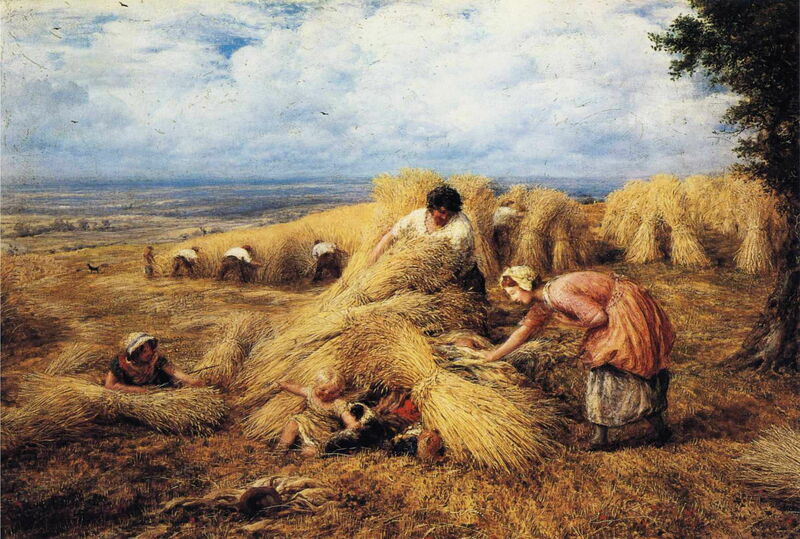 John Linnell (1792–1882), The Harvest Cradle (1859), oil on canvas, dimensions not known, York Museums Trust, York, England. Wikimedia Commons. The Harvest Cradle (1859) is an ingenious rustic scene, in which the children of those cutting wheat are tucked up in freshly-cut stooks. 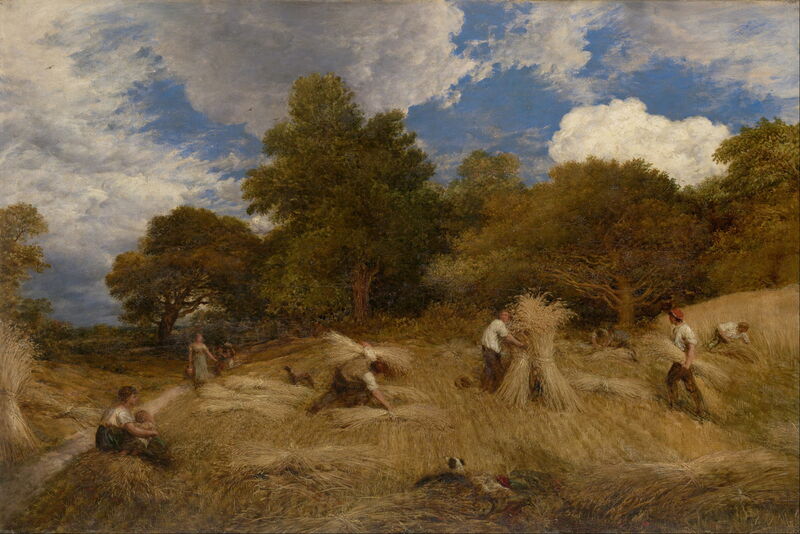 John Linnell (1792–1882), Wheat (c 1860), oil on canvas, 94.2 x 140.6 cm, National Gallery of Victoria, Melbourne, Australia. Wikimedia Commons. 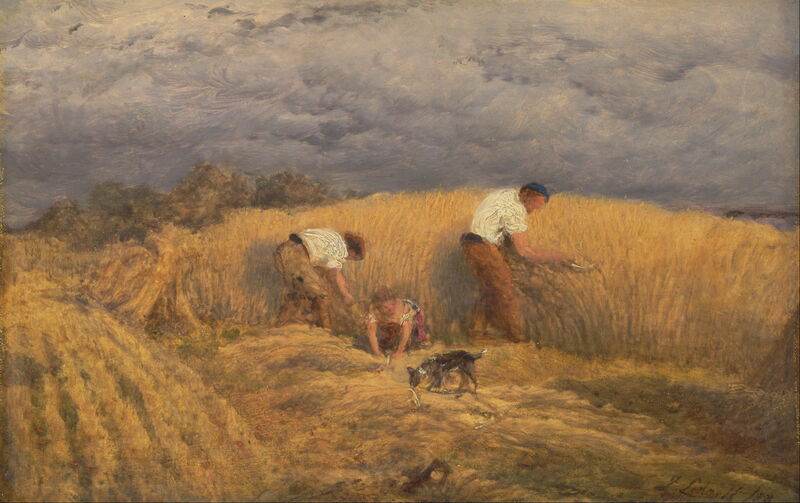 Wheat (c 1860) was painted for the dealer Thomas Agnew, and was one of Linnell’s favourites. It was shown at the Royal Academy shortly after completion, then at the Universal Exhibition in Paris in 1867. 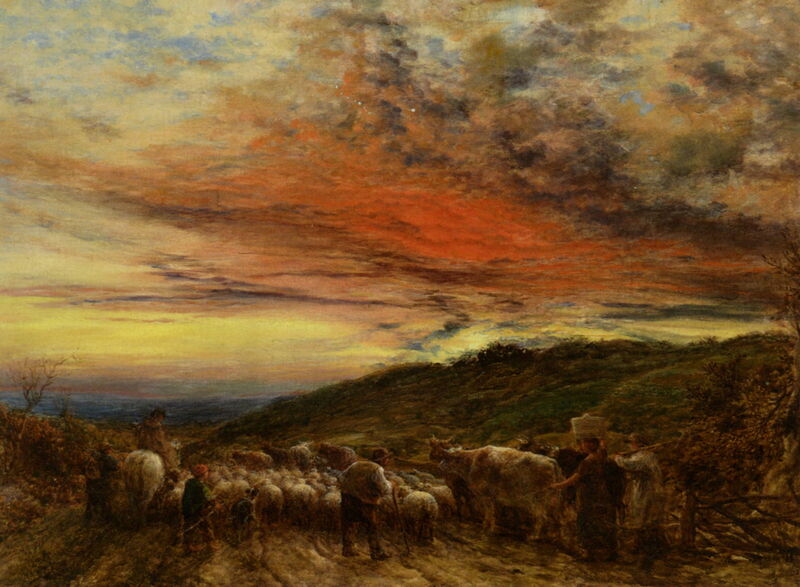 Homeward Bound (1861) shows sheep and cattle being brought back from pasture at dusk. 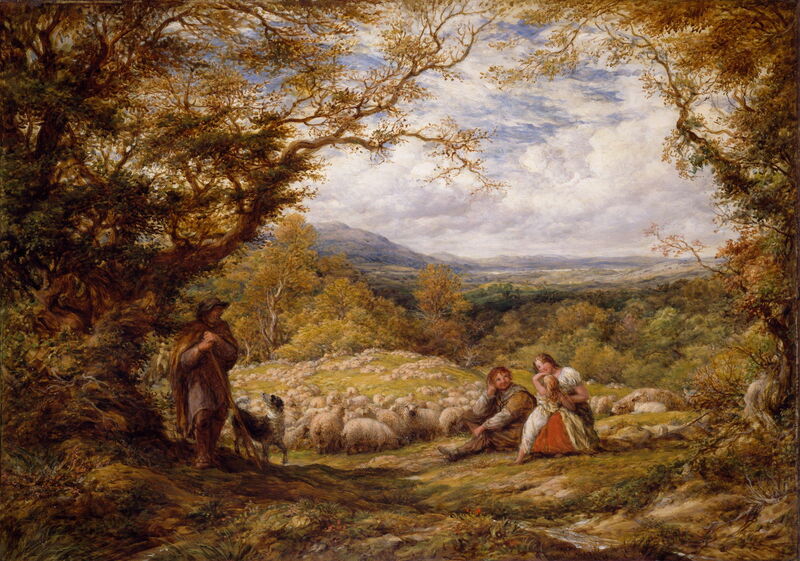 The Sheep Drive (1863) is another idyllic pastoral landscape typical of Linnell’s later work. Linnell continued to paint strongly until 1878, when his failing eyesight and the other problems of old age got the better of him. His last exhibit at the Royal Academy was in 1881, of a painting from 1876. He died in early 1882, just short of his ninetieth birthday. Posted in General, Painting and tagged Blake, landscape, Linnell, painting, Palmer. Bookmark the permalink.